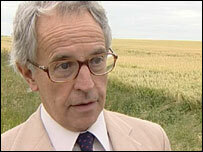 BBC NEWS | Programmes | Politics Show | East: Something sinister in the fields? East: Something sinister in the fields? For hundreds of thousands of people, living in the countryside holds the promise of healthy, pollution free living. Is crop spraying a health hazard? However, many claim they are victims of an insidious poisoning. 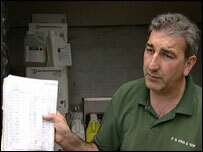 Families in the East of England say they have become ill as a result of chemicals sprayed on crops. Kay Wadey and her children live at Kirtling, near Newmarket. Their home is surrounded by fields. It may look like a rural paradise but they say their health and home is being damaged by the curse of crop spraying. Mrs Wadey said: "My first child was born partially sighted and asthmatic, it's just one of those things the medics say but you can never be sure. "When I was pregnant the second time I can remember running into the field having a word with the farmer, standing in front and waving him down to say, look I have already got problems with one child's health. "I am pregnant I do not want anything that could possibly jeopardise this pregnancy to be occurring. "Can you assure me that those sprays are safe? The farmer did not want to engage in a conversation, which is not reassuring." There is no buffer zone between the Wadey's home and the neighbouring crop. Although farmers are recommended under government guidelines to notify people living nearby, when and where they will be spraying, there is no legal obligation for them to do so. However neighbouring farmer, Sidney Taylor said he follows all of the spraying rules and regulations and as a precaution, he would not advise anyone to walk unprotected in a newly sprayed field. However, the Wadey family's concerns are echoed in the Suffolk village of Broomeswell. Sally Brown recalls the day when she and her dog were caught in a cloud of chemicals as she sat in her garden as a farmer sprayed nearby. "I rushed inside the house and wiped the dog down and then I went and had a shower and washed my hair myself. "The following year my dog died in June of cancer and in August 2003 I was diagnosed with cancer. "Now while I'm not saying it was the spray's fault but I do really think there was a link," she said. Across the country some 250,000 people live next to intensively sprayed fields, with East Anglia the most intensively cultivated. Environmentalists and campaigners want the government to impose buffer zones of between one-and-a-half and three miles between homes and fields to be sprayed. Yet this was rejected following a consultation by the Pesticides Safety Directorate on behalf of Defra. A position endorsed by Alun Michael, Minister for Rural Affairs and Local Environment Quality, in the Commons on 16 June 2004. Furthermore the East Anglian Cancer Intelligence Unit, which analyses data for the NHS, says that so far, there is no evidence of geographical clusters, in relation to cancers potentially associated with pesticides. However the government intends to make spray record keeping by farmers legally enforceable and it is to look at making those records available to the public through a third party. A pilot study will also examine the practicalities of farmers notifying people living near fields to be sprayed. Farmer David King explained: "I spray my crops when they need spraying, I do not spray them when they don't. "I have a raft of regulations, I have to keep all of my spray records and I write them down meticulously when I go out spraying. "My sprayer is MOT'd every year, you know if I've got a problem with my crop I spray it because it has a disease. "If you are ill and you have a virus you go and have antibiotics and that is what I do with my crop." 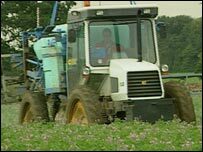 Some 25,000 tonnes of pesticides are used on UK fields every year. Peter Sanguinetti of the Crop Protection Association, which represents chemical producers, said that without pesticides the quantity and quality of the food we eat would be drastically reduced. "Well it's absolutely vital for farmers to have crop protection products. This enables them to protect their crops from nasty bugs, from mould and fungi and from weeds. "And this enables them to produce not just the quantity you need but the quality of food that is safe to eat because it is regulated", explained Mr Sanguinetti. Georgina Downs is a pesticides campaigner. 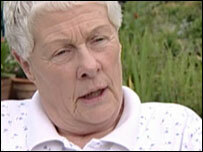 She claims she was made ill after inhaling farm pesticides as a child. It is now her life work to tighten up the regulations governing their use. "The evidence demonstrating the impact crop spraying has had on the health and lives of so many people is unarguable. "But it has been repeatedly dismissed and ignored by the government and its advisers in favour of maintaining the status quo and protecting chemical company interests." She is preparing to sue the government over its failure to introduce no-spray buffer zones around houses. Politics Show East wants your views. Let us know what you think. That is the Politics Show Sunday 11 July at Midday.